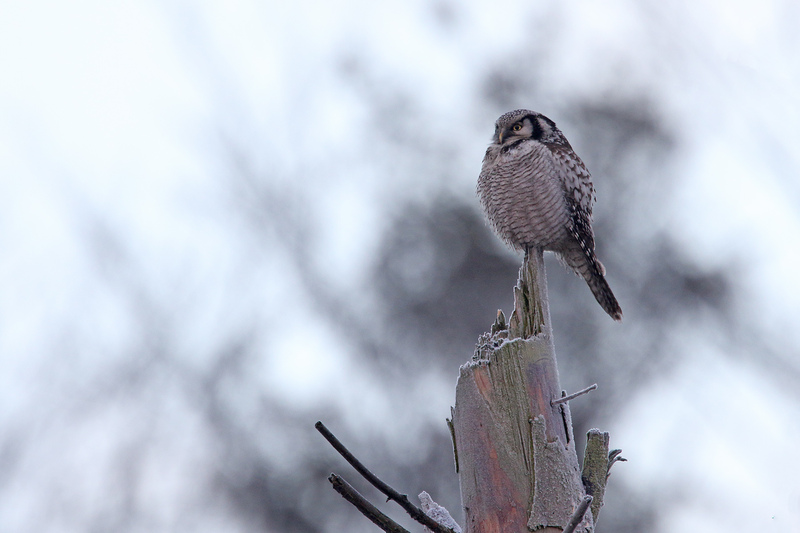 The hawk owl hunts from a number of favourite perches in openings in the forest. It hunts throughout the day, also when not hungry, and caches rodents all over the place for later enjoyment. I really dig cool words – irruption is one. When something irrupts, it suddenly breaks into space where it wasn’t present before – kids often used to irrupt into the school yard when the bell rang, but I suspect iPads irrupt from school bags at the same signal nowadays. The Northern Hawk Owl (Surnia ulula) is known for irregular irruptions, from a sedentary lifestyle in the boreal regions of the Northern Hemisphere and into lower latitudes. Irruptions are thought to be caused by very successful breeding seasons, perhaps leading to scarcity of prey when winter comes. During irruptions the owls show up in numbers far away from their normal breeding grounds, like in Danish Sjælland, where some 10-15 hawk owls have been causing excitement among the birdwatchers since early November – and they’re still going strong. Worldwide, the population of the three subspecies of hawk owls is thought to be reasonably stable, at least if you average it over a 30-year period. In individual years the owl population may fluctuate wildly because it follows the lemmings’ population fluctuations, but fortunately it seems the owls are inherently good at rebounding after population collapses. The hawk owls come from areas with very little human presence/disturbance and are generally completely disinterested in the presence of birdwatchers and -photographers. While that removes some of the challenges in getting decent images from the equation, the birds aren’t exactly cooperative either. The one I was fortunate enough to meet on Saturday stayed high for the duration of my session, so the images are from less attractive angles than I would have preferred, but the rarity of the bird makes up for the reservations, and you get a gallery of the bird all the same. Remember to click on the first image to see the full-size one, and browse in full screen by hitting f11 once you’re inside the gallery. I managed to almost completely miss all the good photo opportunities, due to cold hands, sore neck and heaps of other bad excuses. But two in-flight images almost look alright. There was a mouse cached in this stump. Nice to have a snack when you roost.